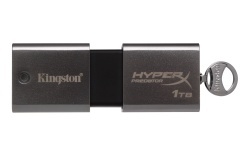 Why go for a hard drive when you could grab one of Kingston’s high-capacity 512GB or 1TB USB 3.0 flash drives? Sure, the new drives cost nearly $1,700 more than your standard 1TB hard drive, but the portability factor might be important to some. Currently, only the 512GB version of available for purchase online, with a hefty pricetag of $1,750 on Amazon. Thanks to USB 3.0, transfer rates are fast, clocking 240MB/s for reads and 160MB/s for writes. The 1TB drive will be available “later in Q1” for a price tag that should be near double of what the 512GB is priced at.